Learn how to pray the Stations of the Cross at the USCCB website. 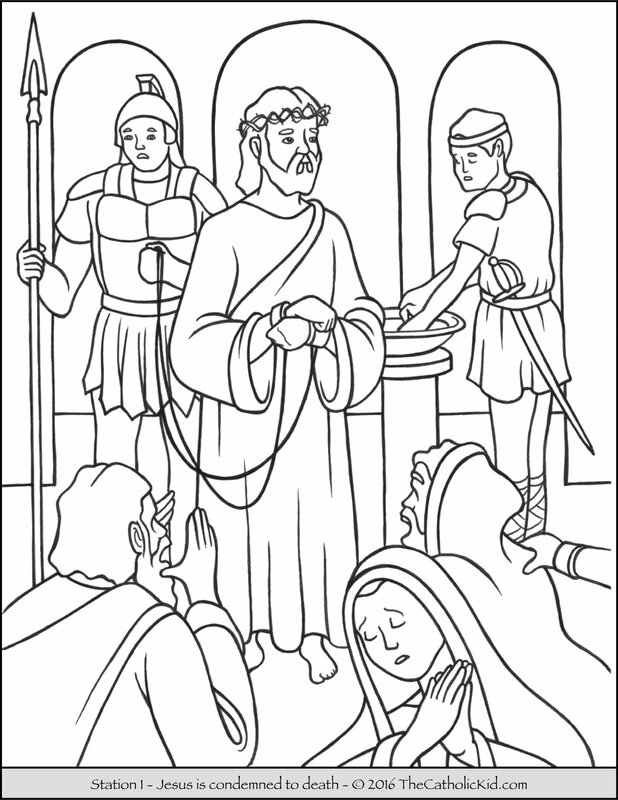 1st station of the cross coloring page (I): Jesus is condemned to death. 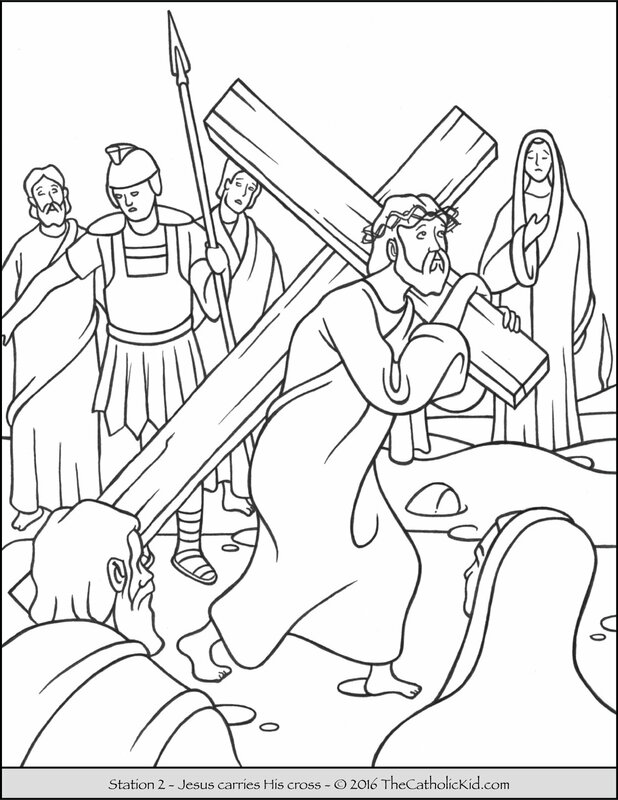 2nd station of the cross coloring page (II): Jesus carries His cross. 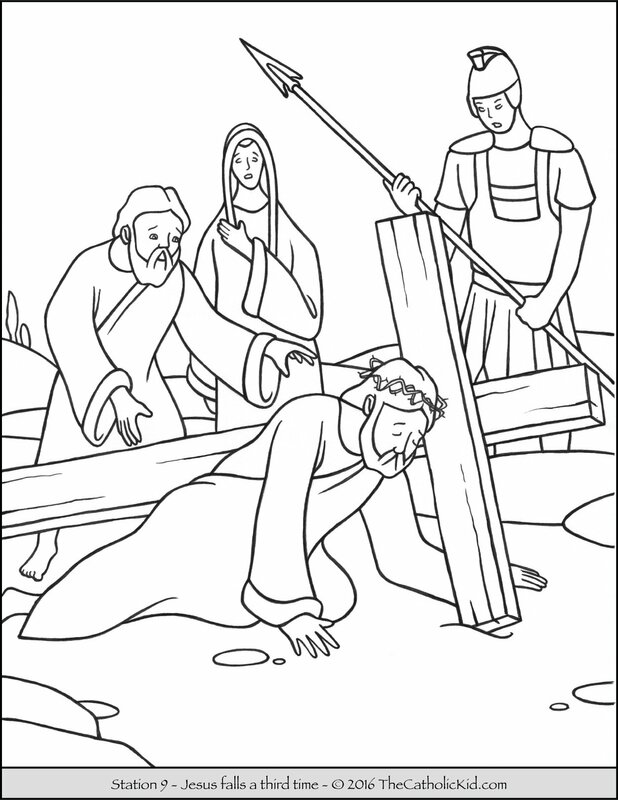 3rd station of the cross coloring page (III): Jesus falls the first time. 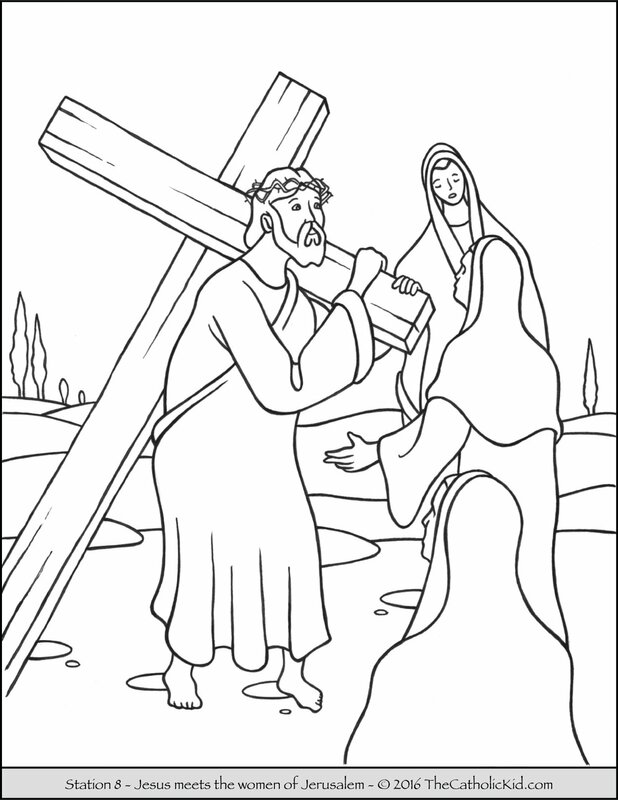 4th station of the cross coloring page (IV): Jesus meets His mother. 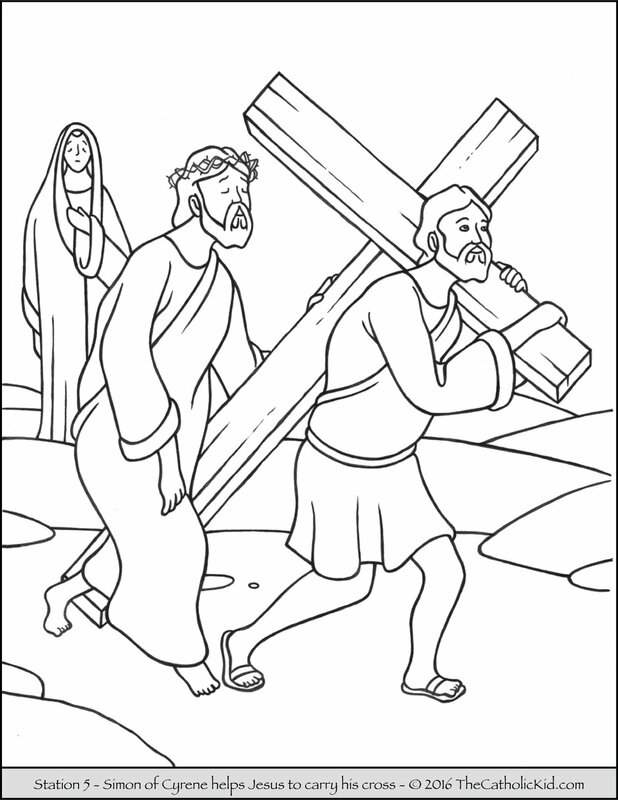 5th station of the cross coloring page (V): Simon of Cyrene helps Jesus to carry His cross. 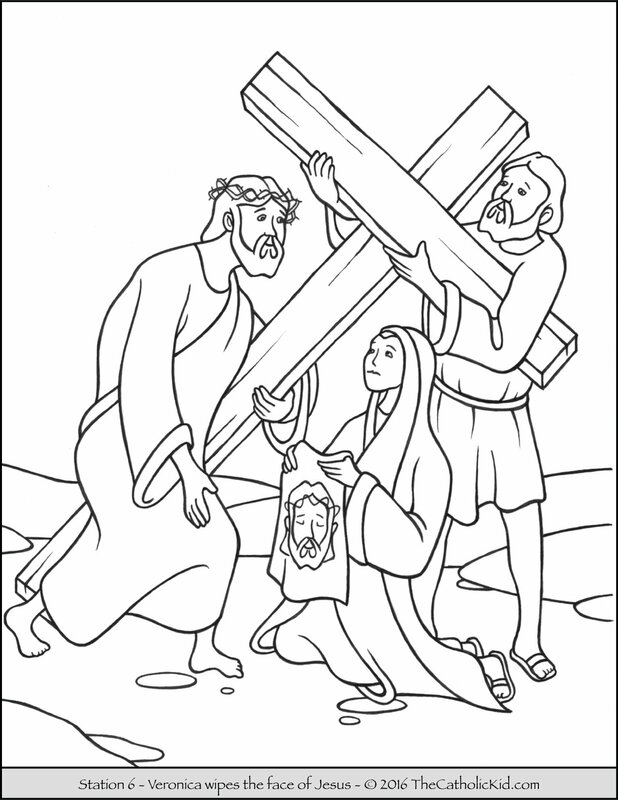 6th station of the cross coloring page (VI): Veronica wipes the face of Jesus. 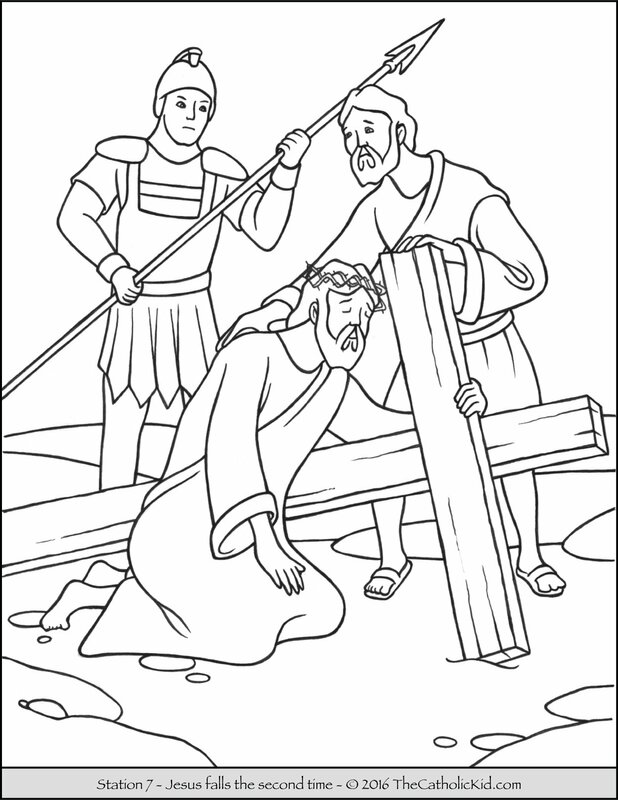 7th station of the cross coloring page (VII): Jesus falls the second time. 8th station of the cross coloring page (VIII): Jesus meets the women of Jerusalem. 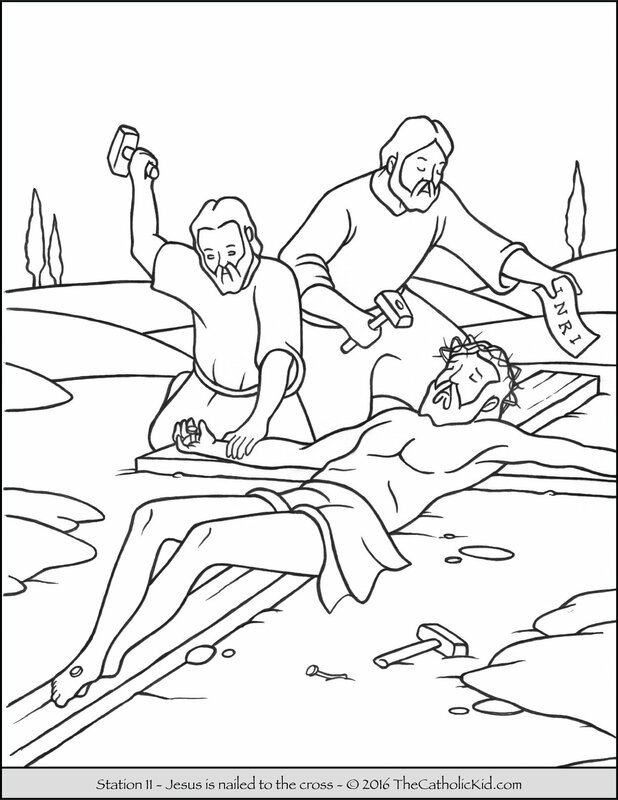 9th station of the cross coloring page (IX): Jesus falls a third time. 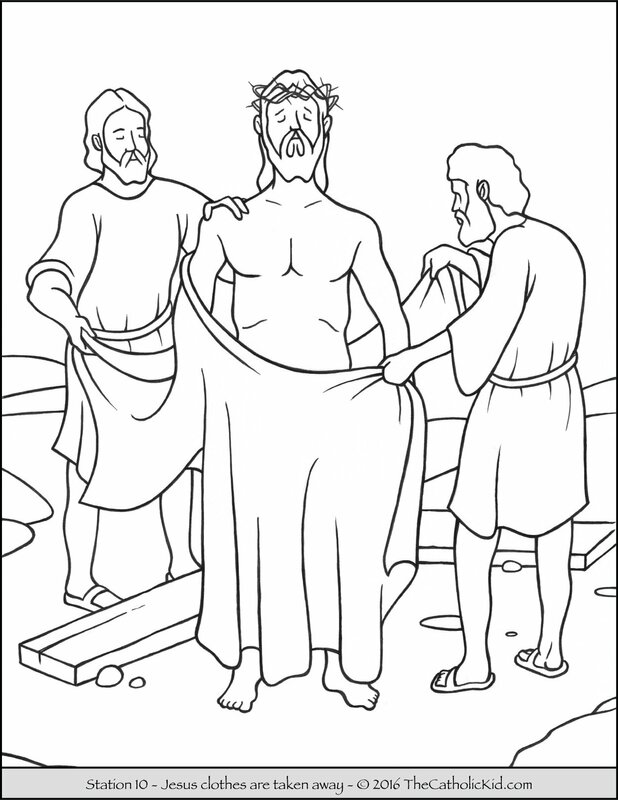 10th station of the cross coloring page (X): Jesus clothes are taken away. 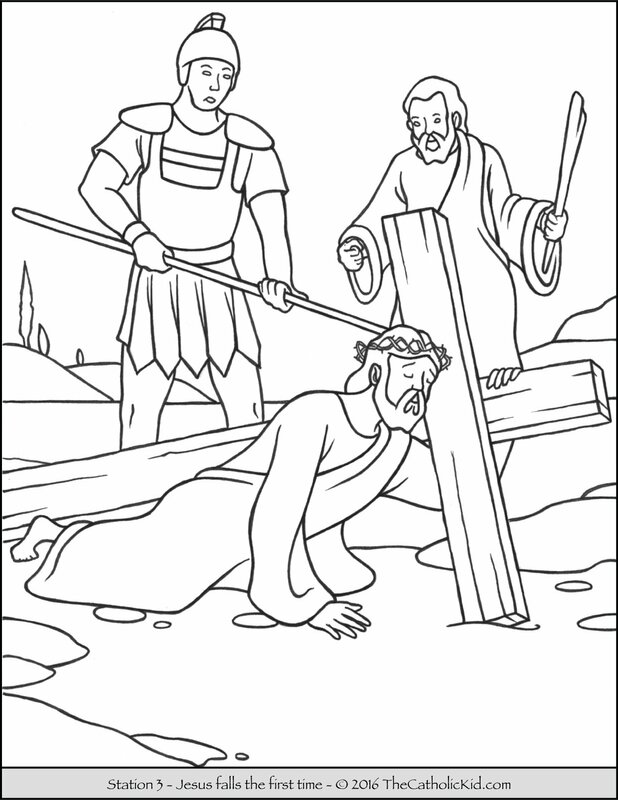 11th station of the cross coloring page (XI): Jesus is nailed to the cross. 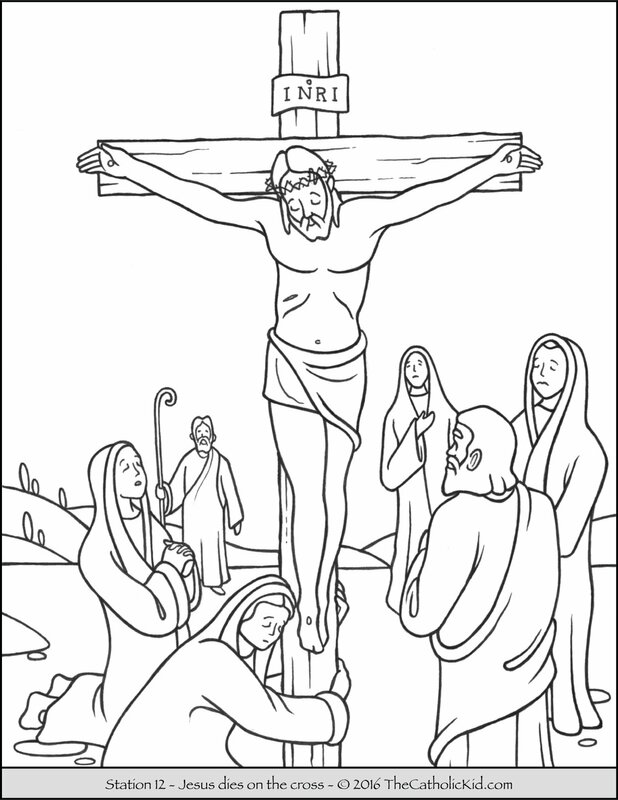 12th station of the cross coloring page (XII): Jesus dies on the cross. 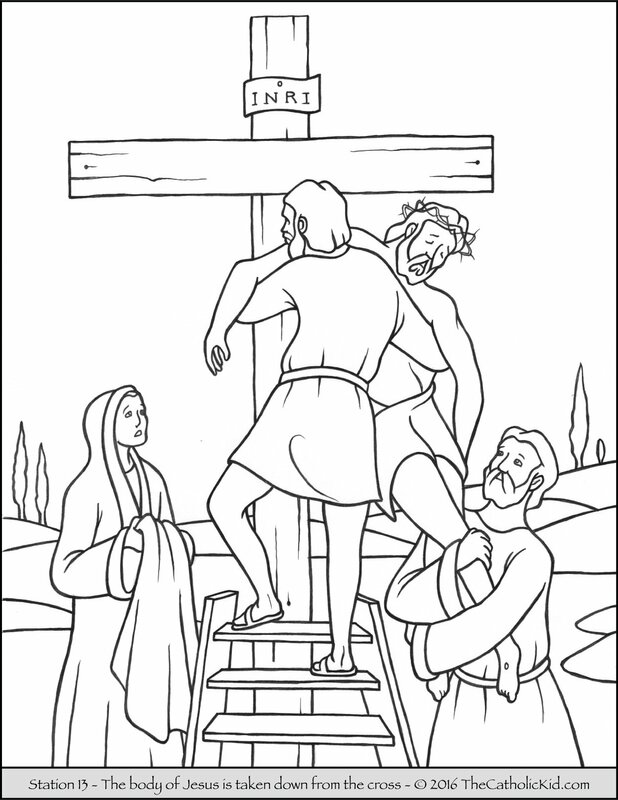 13th station of the cross coloring page (XIII): The body of Jesus is taken down from the cross. 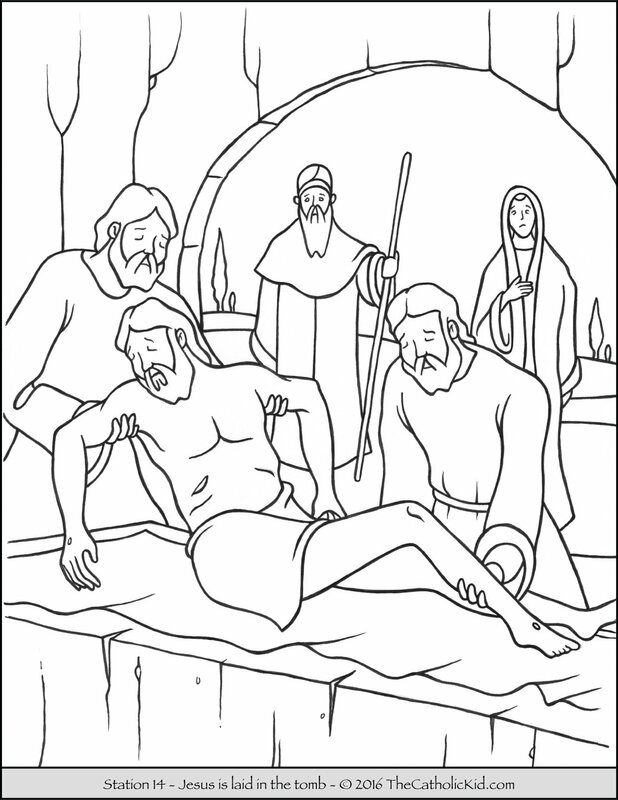 14th station of the cross coloring page (XIV): Jesus is laid in the tomb. Help!! 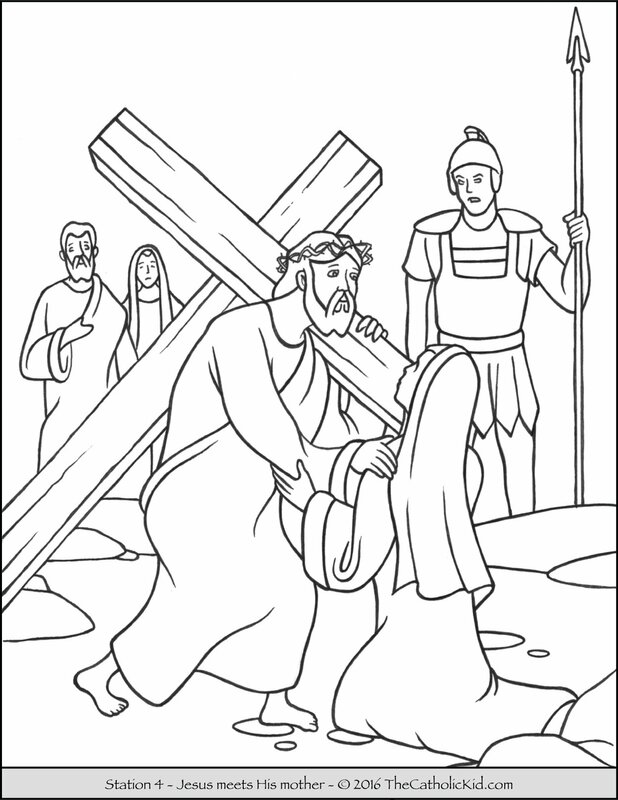 can I get stations 9-14 coloring sheets for Stations of the Cross? My first graders are coloring them and writing the words to accompany the pictures to post in our Catholic school. These are the BEST kid friendly coloring pages I can find! Thanks for the compliment MaryBeth! We’re working hard to get the remaining stations live on the site. We’re hoping to have them up this week, so please check back in a day or two. I’d love to have them for my class, too. And, I agree with MaryBeth-they are the best kid-friendly. Thanks Scarlette. We have the illustrations ready, but there is an issue with scanning we are working out. I think we will have them up very soon this week. Thanks for hanging in there. All 14 stations are live on the site now. Thanks for everyone’s patience! This looks excellent and we would love to use for our school. How do you recommend printing this? I do not see a download button or print option. Looking forward to hearing back from you. Hi Sheila. Sorry for the late reply. To print, please click on the image so it opens up in it’s own window then from your browser, select File -> Print. Hope this helps. LOVE the illustrations. My 2nd Grade CCD with color and act them out tomorrow! PS No apostrophe in its in the possessive in your answer to Sheila above. It’s is short for it is, and the apostrophe takes the place of the ‘i’ in is: it is = it’s (like don’t = do not). Its is the ONLY possessive without an apostrophe. Thank you for making these available. This will make a great activity for our First Holy Communion CRE class. Clean artwork and just enough detail for little 7 & 8 year olds to enjoy. Lovely work. These coloring pictures are perfect for my Pre-k – 1st grade class and perfect for my budget thank you so much. Hi Barbara. Please feel free to use these coloring pages in your classes. Hope the kids enjoy them. Thank you very much! This is our first Lent with children age 3 and 2. I am pretty sure that they will be interested in colouring your printables. Thank you so very much for these wonderful colouring pages for children of the Stations of the Cross. There are the best I found online. God bless you! Thank you for the kind words Sister. Enjoy! First, I thank & Praise our GOD for answering my prayer, & leading me to this site! !😀😁😀 Second, I thank you for providing these beautiful pages for the children to color..I’ve been teaching First & Second Graders for several yrs. & I always use the coloring pages ( when finished) for the children to hold up as we pray the Stations together on Palm Sunday. However, this year, I could not locate/find where my childrens’stations papers were/are. So,Thank you from the bottom of my heart for providing these lovely & truthful depictions of our Dear LORD’S Sacrifice! May our AWESOME GOD Bless & Protect you & your loved ones, Always!! Oh Arlene! Thank you so much for the beautiful words. We are so happy to be able to create and share these coloring pages with the world. God bless you. Thank you for these, what a GIFT! My family and I will be coloring them today as part of our Good Friday journey. They are just perfect. Thank you for your kind words. Enjoy!